Today’s post is brought to you by my bittersweet nostalgia. 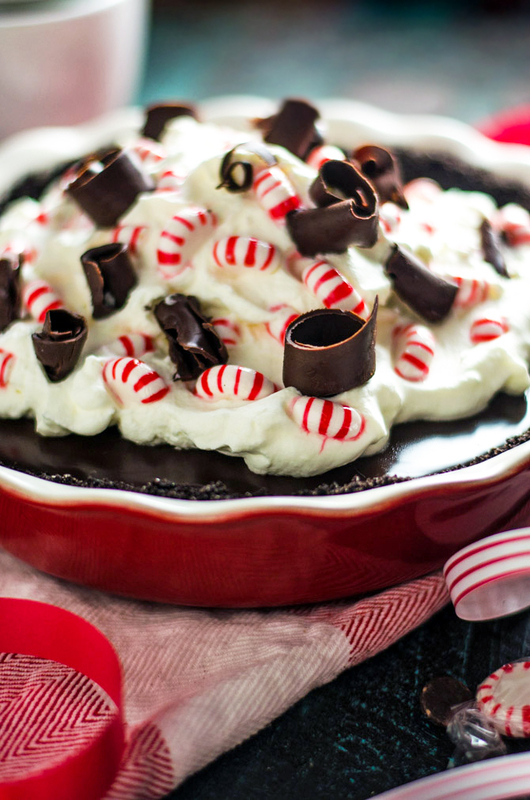 Oh, and McCormick®, whose sponsorship made this luxurious Peppermint Mocha Pie possible. So, I’ve been doing a lot of soul searching lately. And what I’ve realized tonight, thanks to a few glasses of mulled wine, is that I’m not feeling at one with people on either side of the Christmas spectrum: Neither the humbug-muttering, stressed-out Scrooges of the season, nor the Christmas cracked-out Buddy the Elves. I’ve come to terms with the fact that deep down in my heart, I’m truly a Christmas “moderate.” Is that even socially acceptable these days? Judging by a year’s worth of politically-fueled Facebook posts, I can’t be sure. Here’s the deal: I complain under my breath when I see green and red garland on display in October. I might make time to watch, like, one Christmas movie– that’s it. I hate that Christmas Shoes song. Hate it. Imagine me hissing that through my teeth, because that’s how passionately I feel about the subject. But I’m not actually a Christmas-hater to the core. My grinchy heart does grow as we creep closer to the 25th. As the temperature drops and the lights go up, I find myself getting pumped up to the Trans Siberian Orchestra. I start making overly-expensive present purchases, and I bake as if I’m feeding the entire continent with Christmas cheer. Cookies all around, my friends. Cookies all around. One thing I keep noticing is that this time of year I feel both an overwhelming sense of nostalgia for my childhood Christmas traditions and an overwhelming sense of relief that I’m an adult and can do awesome, adulty things. For example, I can afford to buy people gifts that aren’t from that awful school Christmas shop (did you guys have those? ), or drink my aforementioned mulled wine, or use an oven to bake those delicious desserts, which I can eat for dinner if I so choose because I’m a damn grown-up. Since I’ve got a seasonal split-personality of sorts, I’ve decided to start merging my favorite things about holidays then and now. 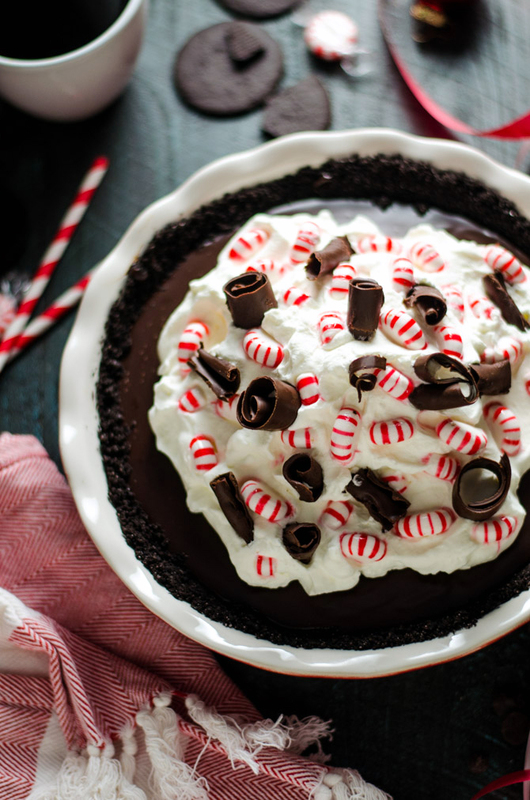 Take, for instance, this Peppermint Mocha Pie. When I was little, my mom always added a tiny bit of McCormick Peppermint Pure Extract to our hot chocolate (which I totally recommend, by the way) and I get a seriously sentimental thirst for it this time of year. However, in the land of cold-weather drinks, coffee is king for me no matter what. And honestly, if we’re talking chocolate, I’d prefer a richer, thicker, all-around-more-chocolatey indulgence over the drinkable kind. Liiike chocolate ganache. In a chocolate cookie crust. Decadent. Clearly the best solution for the Christmas confusion is to combine everything I crave into one glorious, somewhat wistful, grown-up yet still child-friendly dish. 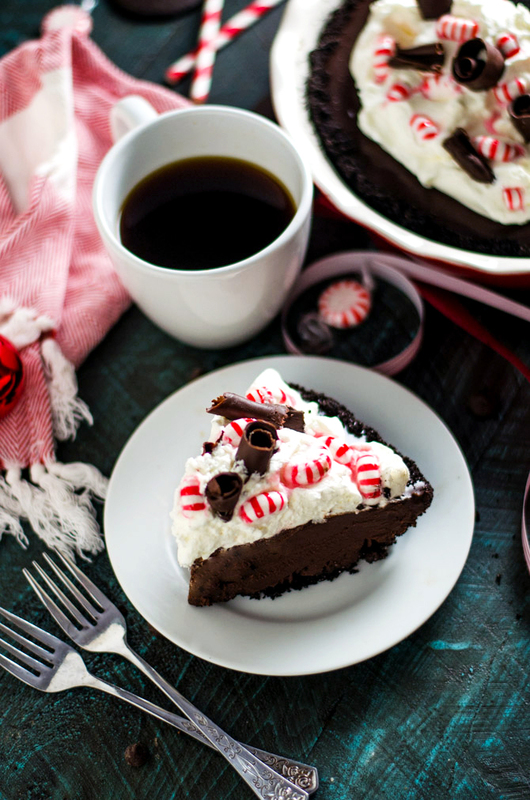 A peppermint hot chocolate inspired, coffee-infused chocolate pie. The best of both worlds. The merger of eras. The simplest pie I’ve ever made. This pie comes together largely thanks to the microwave, which is crazy convenient when you’ve got tons of holiday preparation to tackle. 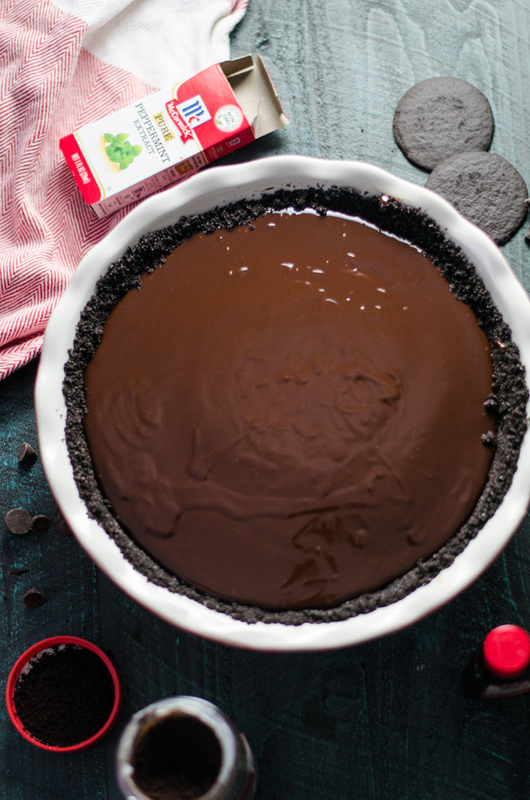 The ganache filling doesn’t need to be baked, I can simply heat some heavy cream in a microwave-safe bowl, pour it over a mixture of dark chocolate and semi-sweet chocolate chips, stir to melt, and viola, I’ve got my pie filling. Well, almost. There are two little details I almost forgot to mention that make all the difference. The first is that I satisfy my coffee addiction by mixing a bit of instant espresso powder into the pie. This gives it just a slight, but noticable coffee flavor — yet still not enough to deter kids one bit. It also deepens and enhances the flavor of the chocolate. And honestly, if more chocolatey chocolate is wrong, I don’t want to be right. Because instant espresso will dissolve in any heated liquid, I simply stir it into the heavy cream before microwaving. It couldn’t be any easier. 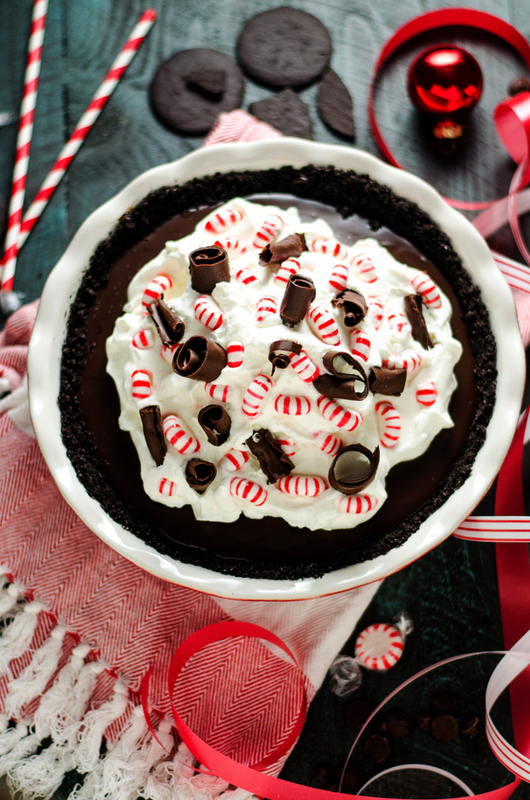 The other detail provides much more flavor to the pie filling but is just as simple: I mix in some of the McCormick Pure Peppermint Extract that I mentioned earlier. Just like when I was a child, the McCormick Pure Peppermint Extract gives the chocolate an authentic peppermint flavor. I always use McCormick extracts because they’re great quality, easy to find, and most importantly, they don’t have that acrid, chemical taste that many imitation extracts produce. 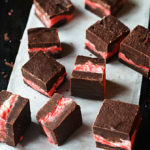 Their peppermint extract gives the full, genuine flavor of peppermint, which is all you want during your baking– especially during the holidays when flavors can bring so much nostalgia! And all I have to do is stir it into the melted chocolate mixture to totally transform the ganache into a wintery filling. Once the ganache filling’s all made, I pour it into a chocolate wafer crust and refrigerate it until it’s solid. I also leave just the tiniest bit of the ganache in the original bowl so that I can eat it with a spoon because I have no self-control. But that’s neither here nor there. While I wait for the pie to set, I whip up some homemade whipped cream, chop up some peppermint candies, and make a few giant chocolate curls for topping the pie. The chocolate curls are totally optional, but they’re also incredibly easy to make. 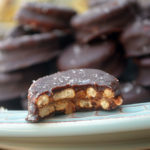 Just like with the ganache, I melt the chocolate with help from the microwave, but this time using vegetable shortening. Then I smooth the melted chocolate mixture into a thin layer on the back of a baking sheet to get an even layer, and then pop it in the freezer for a few minutes. Once it’s just hardened, I use a sharp spatula to scrape the chocolate from the baking sheet. Depending on how thick you spread your chocolate mixture, it may create big curls like mine, or small, thin curls, which are just as pretty. There’s no wrong way to go with them! All together the pie is just as pretty as it is spectacularly delicious. 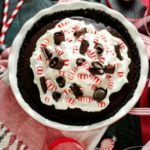 If you’re looking for a stunner of a simple dessert that feels perfectly in-between Christmases past and present, this Peppermint Mocha Pie is your man. Or woman? 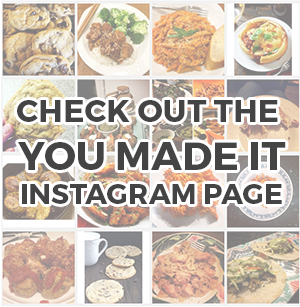 Your inanimate-yet-lovable food object. And I’m willing to bet that it’ll be one thing this season that both the Scrooges and Buddy the Elves can agree to enjoy. Wait wait wait, just one more thing! 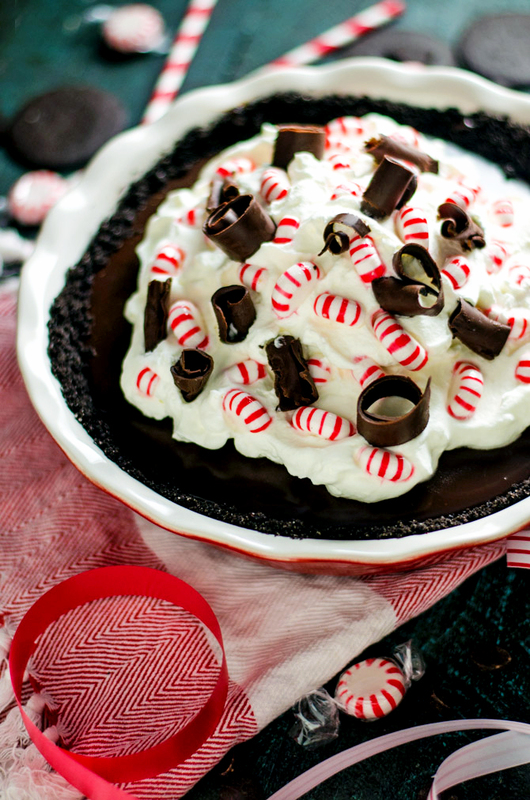 When you make this Peppermint Mocha Pie, don’t forget to take a photo and tag #hostthetoast on Instagram, as always. Then it will show up on the You Made It page and I can show all of my friends and relatives how wonderfully yours turned out! Also, if you’re loving that McCormick Pure Peppermint Extract, feel free to tag McCormick as well. 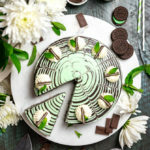 After all, I don’t know if I even would have thought up this awesome pie if it wasn’t for the fact that they sponsored this post. Thanks, McCormick, I owe ya one for sure. 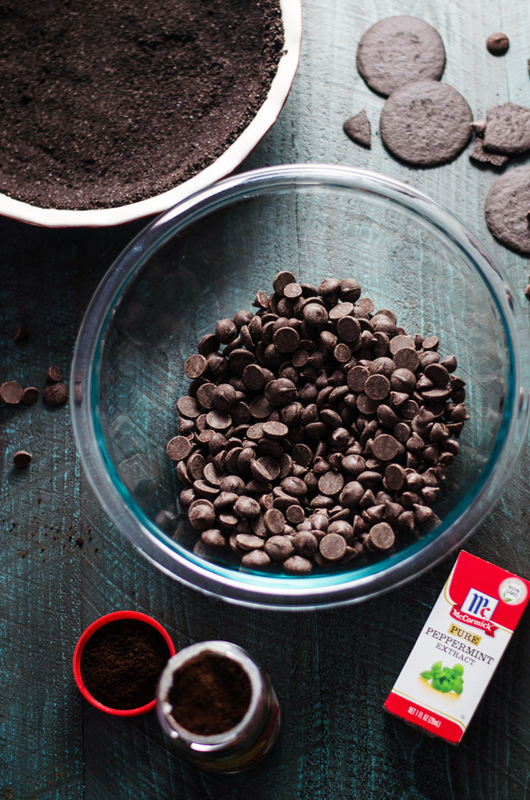 In the bowl of a food processor, pulse the chocolate wafer cookies to fine crumbs. In a medium-sized bowl, mix together 1 3/4 cups of the chocolate wafer cookie crumbs and the melted butter. Press the mixture into a 9″ pie dish. Refrigerate until firm. As the crust is chilling, make the ganache filling. Pour the chocolate chips into a large bowl and set aside. In a microwave-safe bowl, stir together the heavy cream and the instant espresso powder. Microwave for one minute, stir, and microwave for an additional 45 seconds. Pour the heavy cream mixture over the chocolate chips, then stir until melted and smooth. Stir in the peppermint extract. Pour the ganache filling into the chocolate wafer crust. Refrigerate until firm, at least 3 hours. As the pie chills, prepare the toppings. In a small, microwave-safe bowl, combine the remaining chocolate chips and the vegetable shortening. Microwave for 30 seconds, then stir until smooth. If the chocolate chips don’t fully melt, microwave again in 10 second intervals, stirring after each time, until completely melted. Pour the chocolate mixture over the back of a baking sheet and smooth into a thin layer. Place the baking sheet in the freezer for 3-4 minutes. 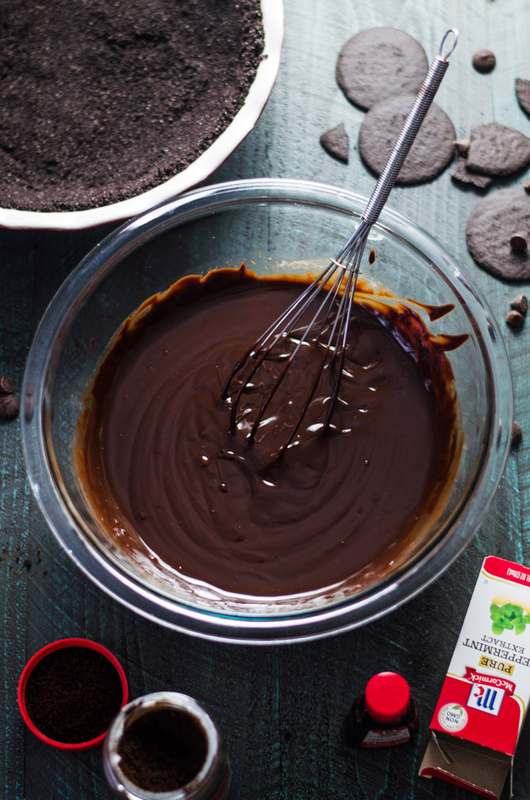 Using a sharp spatula, scrape the chocolate from the baking sheet into curls. Transfer the curls to a sealable plastic bag and refrigerate until ready to use. In a small, microwave-safe bowl, combine the gelatin and cold water. Let sit for 5 minutes, or until thickened. Microwave for 30 seconds, or until the gelatin is liquidy. Set aside. In a large bowl, whip together the heavy cream and powdered sugar using a hand mixer, until thick. Still whipping, slowly pour in the gelatin mixture. Continue to whip until stiff peaks form. Top the chilled pie with the whipped cream. 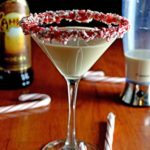 When ready to serve, press the peppermint candies and the chocolate curls into the whipped cream. Serve chilled. That pie makes me want to walk away from my laptop, turn around and take a running jump through the monitor so I can land face down and spread-eagle right on top of it.